$109.99 & FREE Shipping on orders over $59. How do one keg of beer, one keg of sparkling wine, and one keg of root beer, sound for your next party? Awesome? Yeah, we think so too. But, each of these different beverages requires a different serving pressure, and nobody wants to go buy an extra CO2 tank and regulator for each different beverage. Enter the Secondary Regulator! Standard multi-body CO2 regulators are heavy and can make a CO2 tank prone to tipping over, especially as it gets empty. Combine that with the fact that there aren’t Gauge Cages for multi-body regulators and you’ve got a recipe for disaster. Secondary regulators do not attach directly to CO2 tanks, instead mounting to the side or wall of a fridge, kegerator or jockey box. They allow you run multiple keg pressures from one tank of gas. 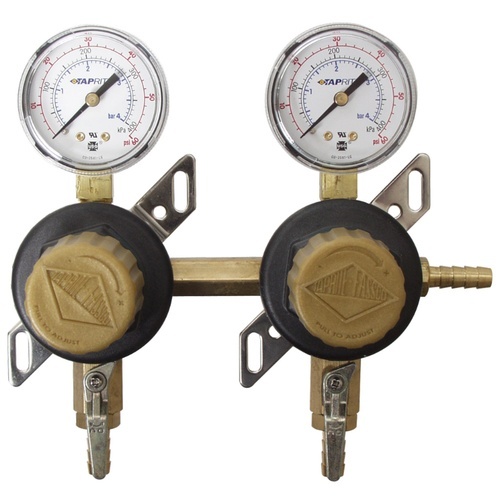 CO2 line from your existing system attaches to secondary input, and the output pressure to the keg is easily adjustable. Features wall brackets for easy mounting. Multiple units can be purchased and ganged together, making it a snap to expand your system at any time. 5/16” barbed outlet fittings with individual shutoff valves. I have si kegs in my keezer, and need two of them to be at different pressure than the other four. Setting up multiple kegs with different pressure/carb levels in the kegerator. This works as advertised & solid constriction. This regulator looks extremely well made and looks like it will last as long as my Taprite Dual Gauge CO2 regulator. I can't wait to hook it up!